As a company that prides itself on exceptional quality at the best possible price, it made good business sense for Costco to develop its own brand to sell alongside big names such as Kleenex, Duracell and Persil. But when you already sell brand names at the lowest possible price, how do you convince members to take a leap of faith on a new private label? The short answer is great value. In 1995, Costco created the Kirkland Signature label, named after the city of Kirkland, Washington, where the Home Office was located at the time. Today Kirkland Signature is one of the most powerful private labels brands in America. We can do more with Kirkland Signature products than other private labels says Tim Rose, Senior Vice President, Food & Sundries because we move huge volumes and our standards for excellence and value, we impact other name brands pricing as well as their quality. Kirkland Signature fish supply comes from deep ocean waters. Our fish oil is not supplied from farm-raised fish. State-of-the-art molecular distillation process is used to remove mercury, PCBs and dioxins, which guarantees purity and potency with reduced fish odor, on all Kirkland Signature fish oil products. 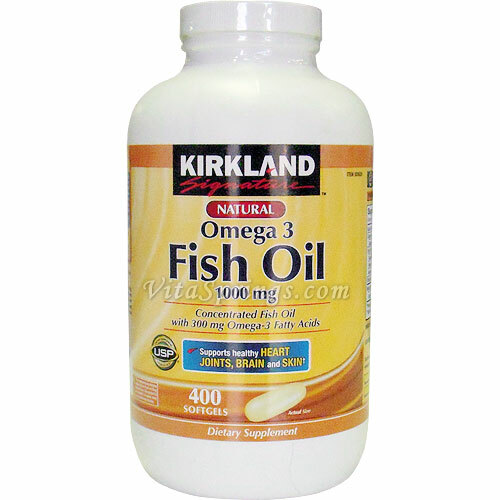 The fish oil is derived from a variety of fish species, to maximize omega-3 fatty acid concentration. Along with stocking private label products in almost every merchandise category, virtually all of our Bakery, Fresh Meat and Service Deli items carry the Kirkland Signature name. Kirkland Signature is a KRW 7.3 trillion brand, and growing! Costco continues to grow the Kirkland Signature brand, and prides itself on maintaining its high standards for quality value and price. We don’t just sell Kirkland Signature… We are Kirkland Signature. Don't be shelfish, share it ! Join Us & Get Coupons! Designated trademarks and brands are the property of their respective owners. Statements made, or products sold through this blog, have not been evaluated by the Food and Drug Administration. All products on this blog are not intended to diagnose, treat, cure, or prevent any disease. © 2019 VitaSprings Blog. All rights reserved.